By: Helen Neal c/o WOWW News! Wade gets the superstar treatment in this week's Country Weekly magazine (July 23rd). Besides the cover, there's a 4 page spread inside with some great new photos taken especially for the magazine. Wade tells the story of his battle with cancer in a forthright, open manner. He has a mission: to save others from what he's going through; to encourage others to not ignore symptoms as he did, but to seek testing. When Wade left the doctor on a very sobering day last November, he made it to his truck and sat pondering the words of his doctor - "We'll get the tests on Thursday; then we'll know how much it's spread." How do you deal with that kind of news? Wade started a song right then that laid out, for all to hear, the heavy thoughts that were running through his mind. Country Weekly went into the studio as he was cutting the song. They've posted a video interview on their site of that event. They have also provided a link for a free download of the song, "Is it Already Time?" I know you'll want to hear his heartfelt message. And the more downloads, the more likely the song will get to radio. Do I hear you thinking that you'll get all your family and friends to download it? 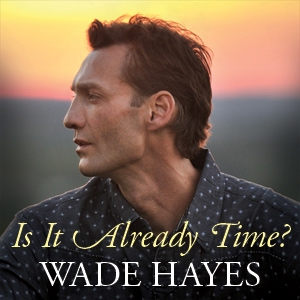 FREE download of "Is It Already Time"
click on photo for FREE download. Wade's 12th and final round of chemo was completed June 25 - 27th. The next big day will be July 23rd - a day of tests to see if he's still cancer free and hopefully to get the port removed. Please keep him in your prayers. This enemy has a way of sneaking back in. The week before that last chemo, he moved to his new place - a small farm that's been his dream for years. He has 11 acres and he's talking about getting cows and chickens. His dog, Jack, is already enjoying it. Between moving and chemo, he went to St. Jude's with Randy Owen to play for their 50th anniversary celebration and squeezed in a photoshoot for Country Weekly. And he remains positive, "They say my odds are up to 50/50. I can do 50/50." He's eager to get his place in shape and get back to writing. The alliance helps those families with living expenses, when medical expenses are leaving them strapped. Wade has appeared on two of their benefit shows. There are plans for a future concert to benefit the Colon Cancer Alliance. A major country act will join Wade for the event. No, I don't have details, yet. I'll let you know when I do. ©2011 - 2012 NutsAboutCountry.com Copyright - All rights reserved.